motor was replaced. Photograph courtesy of California State Railroad Museum. As seen in September 2004. Nevada State Railroad Museum collection. Motor car No. 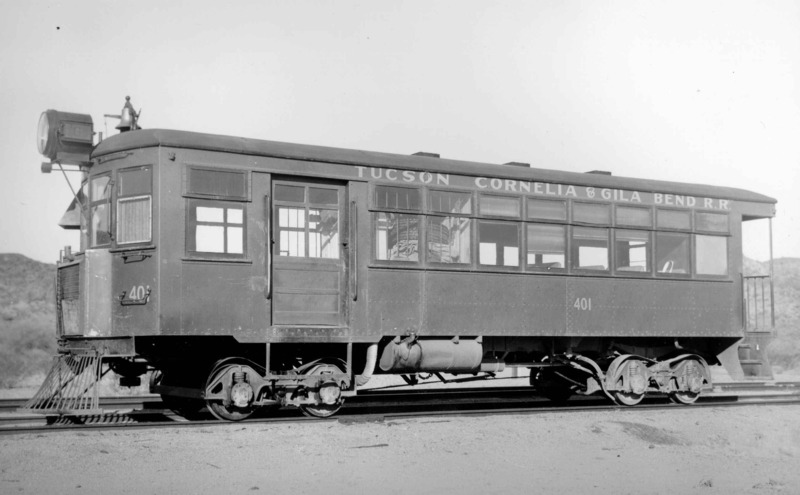 401 was built by the Edwards Motor Car Co. of Sanford, NC and put into service October 1926 by the Tucson, Cornelia & Gila Bend Railroad of Ajo, AZ. The motor car operated regularly until December 31, 1947 and was finally donated to Travel Town in Los Angeles, California. The motor car traveled over 783,000 miles while in service, running between the copper mine at Ajo and Gila Bend, a distance of 43 miles. The car was powered by a six-cylinder White gasoline engine that was installed in November 1943, replacing the original after 17 years of service. During 1963 the motor car was traded to Mr. Lindley Bothwell for two Los Angeles trolley cars. Acquired by Short Line Enterprises in 1975, the motor car was restored and operated in Virginia City during the 1976 season as the Washoe Zephyr No. 50. The motor car was moved to Jamestown, California and stored until it was moved to the Nevada State Railroad Museum in spring of 1988. The motor car is now owned by the museum. The No. 50 received a new 75 HP Cummins diesel engine during the spring of 1997. The diesel engine replaced a 75 HP White gasoline engine. The White engine was installed about 1943, replacing the motorcar's original Continental engine. In 1999, the motor car received a new fluid drive transmission, and, before participating in Railfair '99 at the California State Railroad Museum, was painted to reflect its appearance on the TC&GB.